We just want to take this opportunity to wish all our customers, suppliers and associates a Happy New Year. From 1st January 2013 we will be trading as Ardnet Online Limited (also Ardnet Online Solutions T/A Ardnet Online Limited). Nothing will change in the great level of support and service that you expect from Ardnet and we look forward to working with you in the months and years to come. If making payments to us in the new year please check your invoice for the correct bank account numbers or company name. 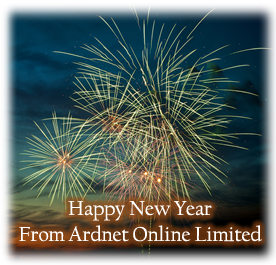 If you are sending us an invoice after 1st January it must be made out to Ardnet Online Limited.